1.1/ What are the requirements to produce? Production is the creation of ships, vehicles, items, weapons and droids in facilities and space stations. All ships may be built in shipyard space stations (see Space Stations Rules) if the ship is the length of the station or smaller (doesn't apply to stations 3km or larger). Factories and factory stations are limited to ships less than 80metres in length. All Boats and Submarines are produced in Naval Shipyard facilities. All medical items are produced in Labs or Medical Factory Stations. All other ships, vehicles, items, weapons and droids are produced in factories or factory stations. The person starting production must be in the Command Room of the facility/station and have access. Be a production faction of the right type (See Production: Production Faction Types). Have sufficient credits to pay for production. The operator must be an active player. There must be at least one Worker NPC in the facility/station managed by the production faction managing the facility/station that isn't in a party. There must be a datacard assigned to the facility/station with sufficient quantity on it* (See Production: Assigning Datacards). The facility/station must be tooled to the type of entity to be produced. * If a datacard is unassigned from the facility/station it won't affect any started projects, only queued projects. In the event of the datacard not having sufficient quantity a check will be made for other datacards assigned to the station that do. If the Manager changes while production is ongoing in such a way that breaks the above conditions production will halt at 100% until the problem is fixed and production is resumed and finished. In the case of the operator changing in such a way as to no longer meet the requirements they will be replaced with the leader of the managing faction. The manager of the facility/station must be set to a production faction of the right type. For most cases this is simply the faction type that matches the type of entity to be produced (ie: Manufacturing factions produce weapons, ships, etc.). There are, however, a few exceptions to this rule. Recycling factions produce the Uglies (X-Ceptor, Y-TIE, TIE-Wing, and C-Wing). Medical factions produce medical items, medical droids, and cybernetics. Mining factions produce LIN-series mining droids and mining explosives (Alpha Plus Charge and Blaststick). Trading factions produce Drug items. 'Worker' type NPCs, a type of Civil NPC, are used in production. The NPCs must be in the facility/station and be managed by the production faction that is managing the facility/station. The amount of NPCs to be used on the project depends on the size and quantity of what is being produced. The number of NPCs is entered upon adding a new project and can be edited up until the project is started. Once the project is started you can't edit the requested number of NPCs, so plan ahead. Each project may have a maximum quantity of 48and up to 20projects may be queued up at once. Projects that are paused or queued may be moved up and down the queue, edited, or deleted at will. H. Appleby runs a group of shipyards for the Rebel Alliance in the Swansea system. He has a shipyard 3 producing two MC-60s, at 34% complete. An incoming transmission demands that the construction of the two MC-60s be paused to give top priority to replacing a MC-80a lost in the Battle of Ailartsua. He pauses construction on the two MC-60s and - after retooling the station to it's new project - the MC-80a begins production. In said battle, 26 X-Wings were also lost, which cannot easily be replaced in time, so Humphrey adds an order for 26 new X-Wings to the production queue and moves it to the top of the queue above the paused MC-60s. After the MC-80a is completed, production can begin on the X-Wings, before the MC-60s are resumed. J. Paxman sets up a shipyard with 6 projects of 12 X-Wings each and 4 projects of 8 Y-Wings each. Production will automatically continue on until it has built all 6 projects, providing he has enough materials to produce the X-Wings. At this point Jeremy will get a message from the station letting him know that he needs to retool the station if the Y-Wing production is to be started. More detailed instructions on how to use the production interface can be found on the interface it self. The materials must be (1) in the facility/station doing the producing or (2) in facilities/stations that are (a) loadable facilities in the city* (See Mining: Storing Materials) or an adjacent space station and (b) are operated by the producing facility/station operator, or the person starting production, or are managed by the producing facility/station manager, or are owned by the producing facility/station owner. * This may change to only adjacent material loadable facilities in the future. When production is started, the oldest pile will be used first. A datacard must be assigned to the facility/station in order for it to produce. Datacards are assigned from Inventory > View Datacards by the faction that owns them. Any faction with a datacard can assign their datacards to a facility/station of another faction. The quantity on a limited use datacard may be edited by the owning faction at any time. When a datacard is depleted the owning faction must either reissue the card or edit the quantity on the existing card. You have the option of assigning a custom image to the datacards you own. There is no need to retool or otherwise alter the production process when the image is accepted. Once set, any entities produced with that datacard will have the custom image set for it instead of the standard image. When adding a project to the queue, or editing one that hasn't yet started, you may choose to use the default image instead of your custom image. For more information, see Datacards: Custom Datacard Images. Anyone with access to the command room of the facility/station who has Level 1 or 2 'Production' privilege may abort production at any time. Materials returned from aborting are placed in the facility/station doing the production, the materials are lost if there is not sufficient room. If the project is building ships or vehicles then they must be completely empty of all cargo and passengers before abort can begin. The amount of materials returned is the percentage of the time that remains minus ten percent. Pausing production can be done at any time but results in the time to produce increasing by 10% of the remaining time. When a project is paused the NPCs that were working on it are unassigned. To resume production you have to be in the command room of the facility/station and have Level 1 or 2 'Production' privilege. Upon choosing the resume production you are presented with a list of ships/vehicles that meet these conditions. Damaged - These will need to be repaired before production can continue on them. See Repair. Missing - These ships/vehicles are no longer present and will need to be returned. Completion Mismatch - These ships/vehicles are not completed to the same extent as the overall state of the project and will need to be worked on separately before rejoining the project. In the event of selecting to resume production only ships/vehicles not meeting the above conditions will continue producing. All ships/vehicles that do meet one of those conditions will be permanently taken out of the project and can't be added to it again*. When the project resumes all available Worker NPCs, up to the maximum NPCs set in the project, are assigned and the time to produce is recalculated. * It will be possible to add such ships/vehicles back into the queue at a later date. There are several places where the finished product may be placed. Ships 80 metres or larger are always produced outside the space station. Other ships and all vehicles are produced inside. Items, Weapons and Droids are placed in cargo containers (see Production: Cargo Containers) in the entrance room when production finishes. 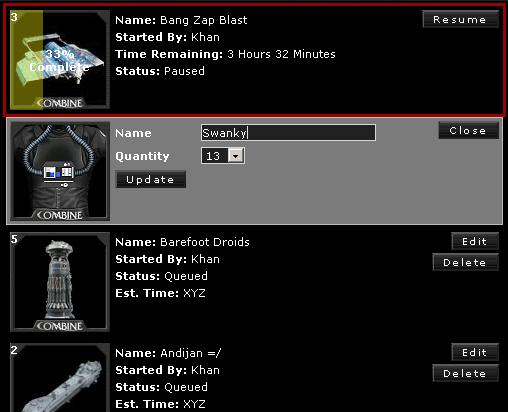 Items, Weapons and Droids are produced in batches. Unlike ships and vehicles, which are always in units of one, an item, weapon or droid can contain up to 50 in a single batch. The material requirements for batches are those listed on the rules pages. So, if the toolkit material requirements are 2 units of meleenium, 1 of rudic and 2 of varium that is for an entire batch of toolkits, not just one. Similarly, the quantity on the assigned datacard is the number of batches that can be produced, not the number of items, weapons or droids that can be produced. Batches can be anywhere from 1 to 48. Weight: Weight of the item, weapon or droid. Items, Weapons and Droids are packed into cargo containers when production finishes. The containers cost nothing, cannot be filled with anything else and will disappear when everything has been removed from them. They will be placed in the entrance room of the facility and will be labeled according to what they contain. Upon adding a project to the queue you may choose the number of products that will be placed in each box. The batch quantity is the minimum number that may be put in each box, size permitting. When changing from producing one type of entity to another the facility/station needs to be retooled to that type of entity. Retooling is free and takes time determined by the following equation. The retooling process can be started by anyone with access to the command room of the facility/station who has Level 1 or 2 'Production' privilege. The facility/station doing the production will sometimes make contact with the relevant parties (see Production: Ships/Vehicles being removed during production) when something has gone wrong, or when production finishes. Messages are currently sent in the following circumstances. A project moved to automatically is lacking something that it requires (eg: materials, credits, capacity...). See Production: What are the requirements to produce?. A ship/vehicle is removed from the facility or station. * May be removed if it occurs too often. If a project consists of more than one entity, there are modest savings in time and cost, compared to producing the same number of entities in projects each consisting of a single entity. No additional workers are required. This is known as the 'Mass Production Factor'. Total Materials: For ships, vehicles and droids this is the total units of material the entity requires. For items and weapons this is 2.5 * (RMP^0.4). Production Mod: A modifier based on the class and size of the product. These are fixed numbers that are not adjustable by players. Management: Management skill of the person starting production, or Management skill of the facility/station operator if the project automatically continued. NPC Mod: The number of NPC workers used in production has a large effect on the time of production. Every entity has an ideal number of NPCs that are required to produce it, and there are severe effects on the production time when trying to use significantly more or fewer NPCs. H. Appleby tries to save credits on producing the 2 MC-80a's by using only 2/3 of the required NPCs. When he gives the order to start the project, the ETA given by the foreman is almost 50% greater than normal. Civ Level: When on or above a planet is the CL of the planet, when in a system is the average CL of inhabited planets in the system, 0 when in deep space. Location Mod: 1 for facilities, 0.9 for space stations. The ideal number of workers is a secret function of the length/size of the entity. To prevent the flooding of the economy before combat is released there will be temporary increases in the time to produce. As combat draws nearer, or if these don't prove necessary, the increases will be reduced or removed completely. Morale/Crime/Tax Level: When on or above a planet is the values for the planet, when in a system is the average values for inhabited planets in the system, when in deep space morale, crime and tax are 0. As per Planetary Economy: Morale (M) rules, the group in control of the location receives a cut every time production takes place. On or above a planet: Goes to the group controlling the planet. In a system, not above a planet: Goes to the group controlling the system. A project directly started by someone gives XP to that person. Any projects that are automatically continued send their XP to the operator of the facility/station. A project that is resumed at some point gives the XP to the person who resumed. Quantity: Number of products in the project. Addons and changes that may be made to production in the future. Production projects for ships/vehicles allow removal of them as each is finished, rather than all finishing at the end. Programmer Note: See the bottom of the production class for notes on the required changes. Time/Cost reductions for large stations producing large ships. For partially completed ships/vehicles removed from their projects, allowing their completion at a later time. Sourcing materials for ships/vehicles at the facility/station (ships/vehicles would be required to stay at the location).